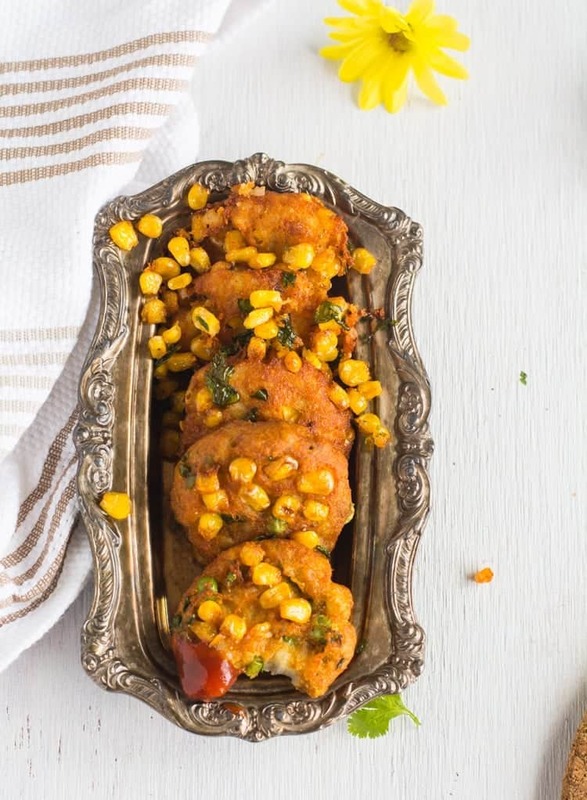 Corn Cutlet Recipe is very simple yet delicious snack best to be served in the tea time. A deep fried appetizer made with potato, corn kernels and herbs. The best recipe for parties and family gatherings. 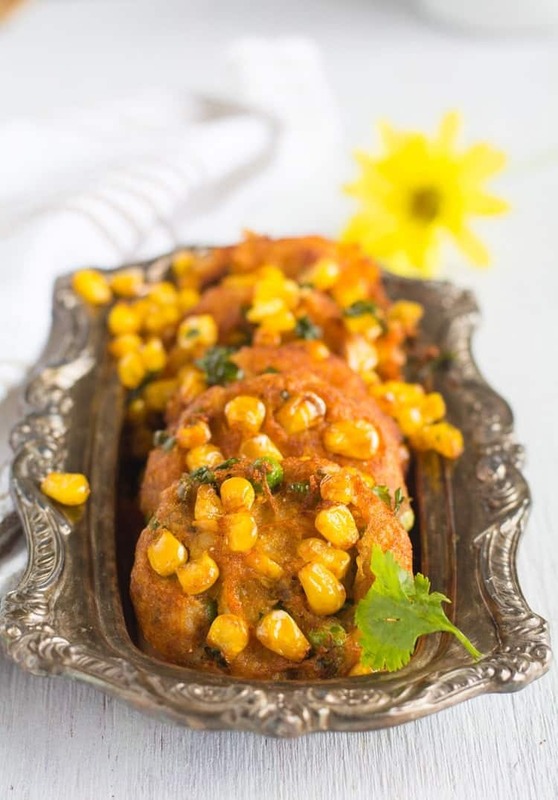 Corn cutlet does not require much time for preparation or long procedures. I always try to share recipes with more simpler steps and with the lesser ingredient. And this is how I cook at home. I have very very basic ingredients stored in my cabinets. I mix and match them and create my own flavorful masalas. I have very very basic ingredients stored in my cabinets. I mix and match them and create my own flavorful masalas. I never had any special readymade masalas from the stores like Biryani masala, Sambar masala or Pav Bhaji masala. My two decades of kitchen experience made me understand each and individual spices responsible for bringing out unique flavors. I could guess how the end product will taste if I add cumin powder or fennel powder. And I this idea gives me a knowledge of trying out various dishes successfully. And I try to share this information as far as I could in all my posts. So, every dish is unique though the ingredients and the process have some similarities like Potato Cutlet or Bread Cutlet. The uniqueness of this cutlet is the slight sweetness of the corn kernels and its crunchy texture. To enhance it, here we have added lesser chili powder. Since corn is bland in the flavors, I have added coriander leaves to make cutlets more flavorful. This is how I make or convert recipes. If the corn kernels are frozen, thaw it before adding here. If it is frozen it may splutter while deep frying. In a mixing bowl, mash potatoes well, add corn kernels, chili powder, chopped coriander leaves and salt. Mix them gently so that every ingredient combines well with each other. Divide them into equal sized balls. Make them into desired shapes. Flat circle shapes are most desirable ones because it gets cooked evenly. Heat oil in a pan. In medium heat fry them until they become golden brown on all the sides. Transfer to paper towel to remove excess oil. And serve corn cutlets hot with tomato ketchup, hot sauce. 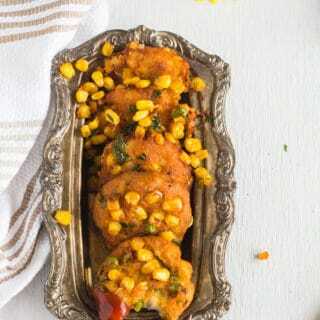 Corn Cutlet Recipe, delicious crispy snack best to serve in the tea time, made with mashed potato, sweet corn kernels and spices. This recipe is with step by step pictures to make it quick and easy. In a mixing bowl, mash potatoes well. In the same bowl, add corn kernels, chili powder, chopped coriander leaves and salt. Mix and combine them gently. Divide them into equal sized balls. Make them into desired shapes. Heat oil in a pan. In medium heat fry them until they become golden brown on all the sides. Serve corn cutlets hot with tomato ketchup, hot sauce.